Late summer harvests of alfalfa are often disappointing to growers, with low yields and also low quality. This is often called ‘summer slump’ – which occurs with alfalfa but also (more severely) with cool-season forages like timothy, ryegrass, orchardgrass and fescue. The extent of the reduction in yield and quality depends upon heat, irrigation, cutting schedule, and weather patterns. This year, for example, many regions had hot temperatures in late June and early July, but more moderate temperatures (so far) in August. Why does this occur? Its causes are somewhat complex. An excellent recent article by Mike Ottman and Ayman Mostafa from the University of Arizona, Tucson, explores the causes of summer slump in alfalfa, which is most often during the hottest time of the year (July-September, see: "Summer Slump” article in full). It’s also most apparent in the low deserts of Arizona and California where temperatures commonly exceed 110°F each day, and night temperatures are frequently above 80oF. Yield Slump. 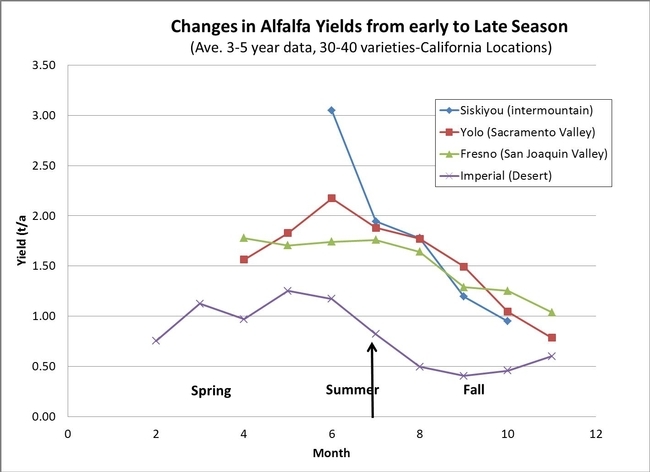 Typically, yields of alfalfa are highest in the first several cuts of the year, and then can fall to almost half that in late summer (see data Figure 1, Arizona and Figure 2, California). These yield declines may be due to two factors: 1) short days and fall dormancy response, especially in northern areas, and 2) excessive heat stress, especially in hot arid zones. These late summer yield slumps seem to be much more important in the southern desert locations, but reductions in yield also occur in many other alfalfa production areas. 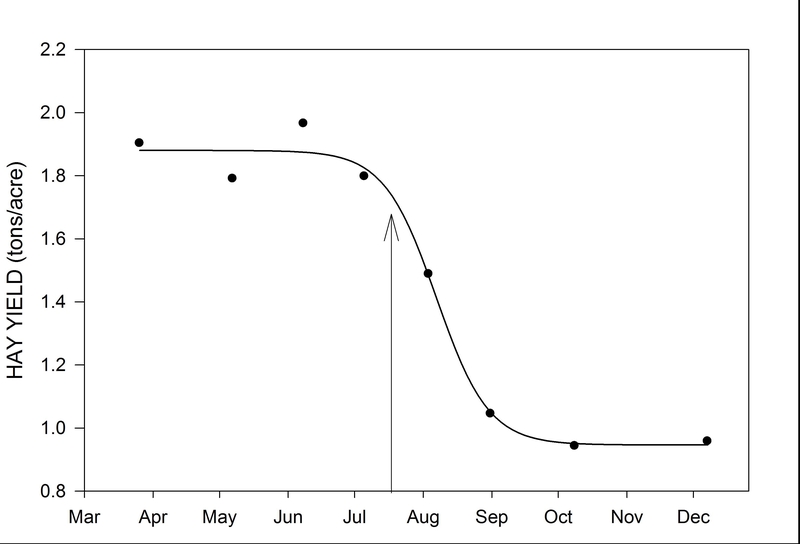 After the summer solstice (June 21), day length becomes increasingly shorter, often reducing available solar radiation, but also causing physiological changes in the plant to favor root vs. shoot growth (Fall Dormancy response). This is most apparent in northern areas and with ‘dormant’ varieties. It’s interesting to note the differences between regions (Figure 2), but all regions show late-summer yield declines. Figure 1. Yield changes over the season in Maricopa, Arizona. Figure 2. Yield changes over the season at Siskiyou, Yolo, Fresno, and Imperial Counties (north to south) in California. Quality Slump. If yield declines weren’t bad enough, often quality is lower as well. 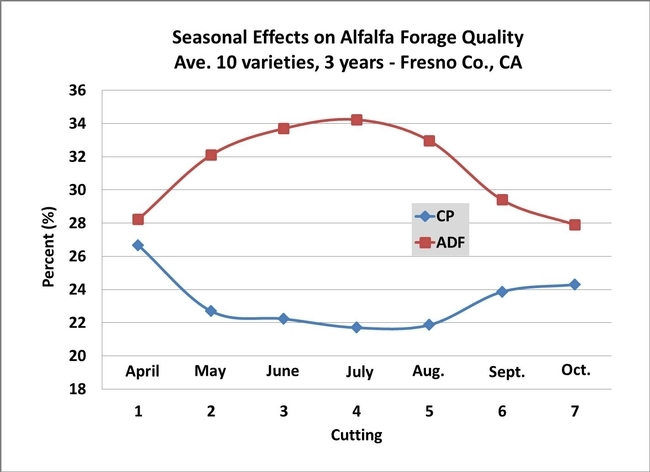 Data from Fresno County variety trials shows increases in fiber content (ADF, which determines TDN and RFV) during the summer months, and declines in Crude Protein after the first cuttings, but quality improves in the fall (Figure 3). This confirms what growers know – that it’s more difficult to produce high quality hay in the summer than in the spring or fall. However, the causes for quality differences over the summer are somewhat different from those of yield differences—but both are related to temperature. Figure 3. Changes in quality (protein and fiber) over the season. Why a yield decline? 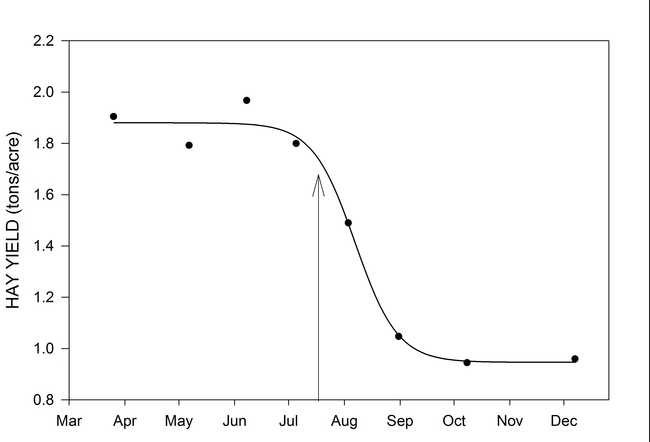 Some of the late-summer declines in yield may be due to shorter days, and Fall Dormancy response (the plant slows growth and stores root reserves in preparation for winter conditions), which is a daylength- and temperature-dependent response. This is most likely the key cause in Intermountain production systems (3-4 cut system). Other summer yield effects are likely due to heat and stress under harsh summer conditions, which are probably much more important in southern locations. Temperature is a key driving force, likely especially night temperatures in desert and Mediterranean regions. With high temperatures, night respiration is higher, and the plant is unable to store root carbohydrates under short cuttings schedules. If growers harvest in the bud stage, plants do not have the ability to recover root reserves (Figure 4). Plants have little stored root reserves, flower very early, becoming reproductive, which also takes away from leaf and stem growth, and subsequent regrowth. During the day, the inability for the plant canopy to cool itself is a problem – in the low deserts with a summer monsoon season, high humidity is an exacerbating problem, since evaporative cooling doesn’t work as well. This, coupled with high respiration rates during the night, and water and salt stress are thought to cause early flowering, smaller leaf size, and lower growth rates. Figure 4. Changes in root carbohydrates after harvest of alfalfa. Why a quality decline? In the case of quality, the causes are somewhat different, but also related to temperature. Very rapid lignification of the stem material, and addition of plant cell fiber occurs rapidly under the high temperature conditions in the summer. 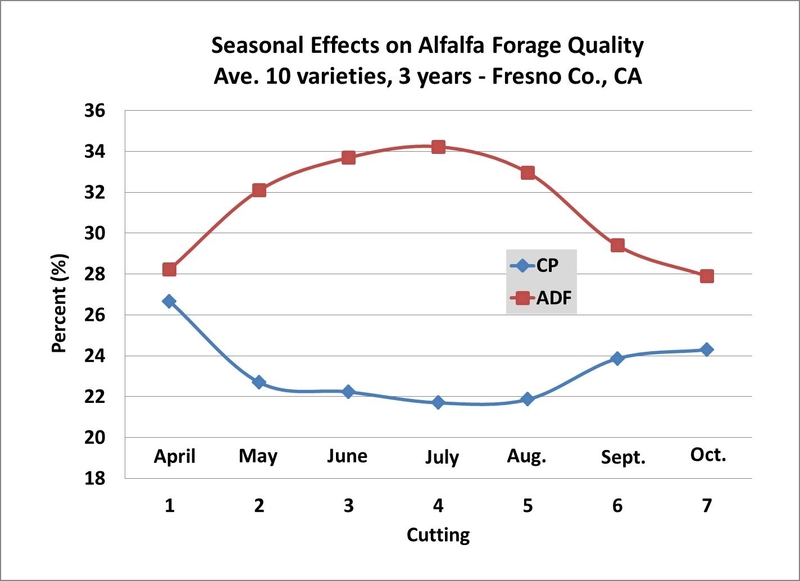 We have measured ADF (fiber content) increases after only a few days of hot conditions in Fresno County, for example, taking only 1.5 days to increase by 1 point, whereas in the spring or fall it takes 3-10 days to change 1 point ADF. In addition to this, soluble carbohydrates (plant sugars) in the leaves are utilized with high nighttime respiration rates – soluble carbohydrates contribute to high quality and are a part of the TDN. The heat-driven growth rates not only deplete root reserves, but also increase fiber content, reduce soluble highly-digestible carbohydrates, and reduce quality. The higher level of soluble carbohydrates, coupled with slower lignification are thought to be the major reasons for the high quality of cool-season grown alfalfa, regardless of where it’s grown. The importance of cutting schedule. Ottman and Mostafa (2013) explore a number of important influences on the summer slump (variety selection, fertilizers, weeds, pests, etc.) – but one important factor is harvest schedule. 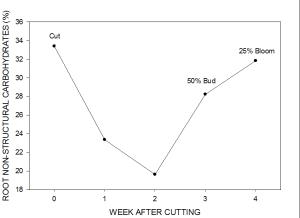 Since it is often very difficult to obtain the highest quality during hot, stressful months of summer, many agronomists have recommended extending cutting schedules (e.g. to 50% bloom) in the summer, to try to maximize yield (as much as possible), and to replenish root reserves. Growers may have to live with lower quality (find markets that will accept a higher fiber hay), but this strategy favors the crop, enables better growth later, and allows the stand to last longer. This can be followed by a ‘short’ cutting cycle which favors quality (see Yield-Quality Tradeoff blog published in July). This is a ‘staggered’ approach—at least two such ‘rest periods’ are recommended over the summer months to encourage better root reserves, increase yields and let the stands last longer. Although there are no magic solutions to heat and summer stress and late-season yield declines, harvest schedule is likely one of the most important things growers can manage to deal with the 'summer slump’. See ‘Summer Slump in Alfalfa’ – University of Arizona Cooperative Extension for more details and references.